Representing His Holiness, Patriarch Krill and the Moscow Patriarchate was His Grace, Bishop Flavian of Cherepovets and Belozersk. Metropolitan Tikhon welcomed Bishop Flavian and asked him to convey his gratitude and greetings to His Holiness, Patriarch Kirill. 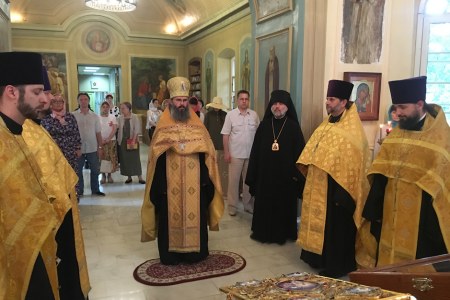 After conveying the warm greetings of Patriarch Kirill to Metropolitan Tikhon and all participants in the AAC, Bishop Flavian spoke about his diocese and its current ministries. Established just three and a half years ago, the diocese embraces over 100 parishes served by 67 priests. It also maintains two monasteries, while a third monastic community is in the process of being planted. 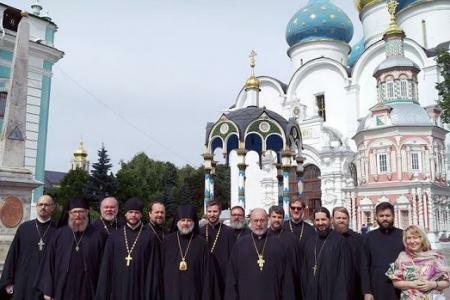 The presence of Bishop Flavian at the 19th AAC follows the successful participation of a delegation from the Orthodox Church in America in a Summer Institute sponsored by the Moscow Patriarchate and the Saints Cyrill and Methodius Institute of Post-Graduate Studies earlier this summer. 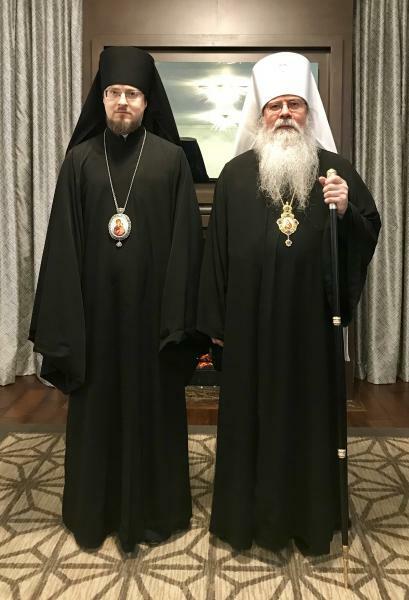 The Institute was the fruit of discussions between Patriarch Kirill and Metropolitan Tikhon during the latter’s visits to Moscow in 2016 and 2017, at which time ways to acquaint clergy from both Churches with the life of the Church in Russia and the Church in America were discussed. 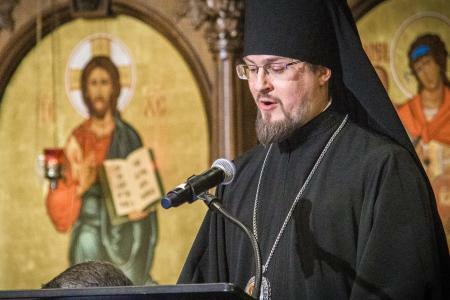 The OCA delegation was led by Bishop Daniel and Archpriest Kirill Sokolov, Dean of Holy Trinity Cathedral, San Francisco, CA. Clergy participants represented several OCA dioceses. 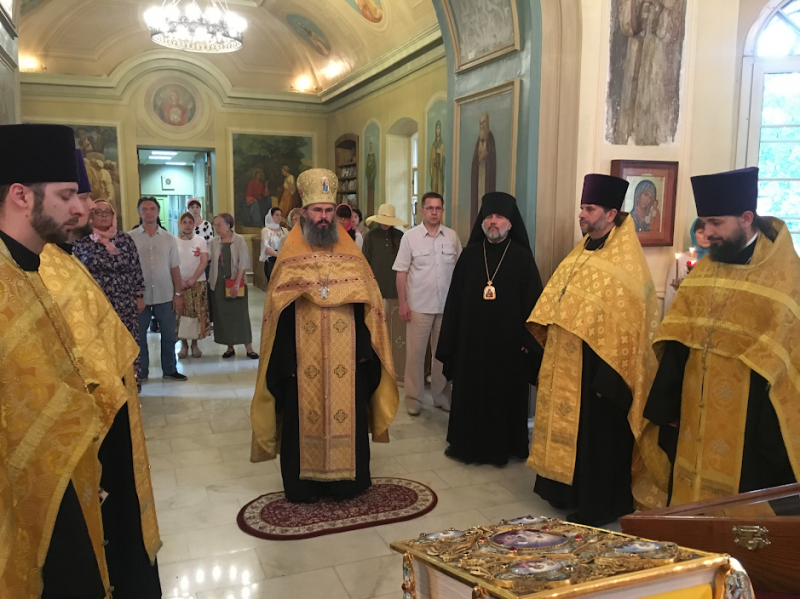 The delegation’s busy agenda included meeting with and celebrating the Divine Liturgy with His Eminence, Metropolitan Hilarion of Volokolamsk; attendance at a variety of lectures and presentations by Church and secular experts; and visits to the Synodal Catechesis Department, the Synodal Department of Church-Society Relations, and the Synodal Department for Charity and Social Service. 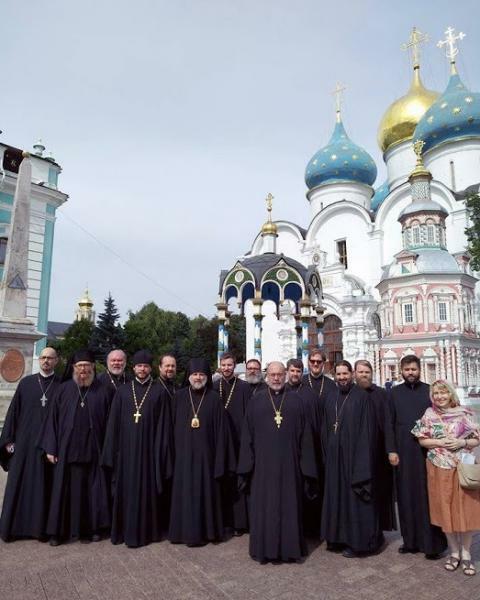 They also visited numerous churches, monasteries and shrines across the Moscow region, including the OCA’s Representation Church of the Great Martyr Catherine. 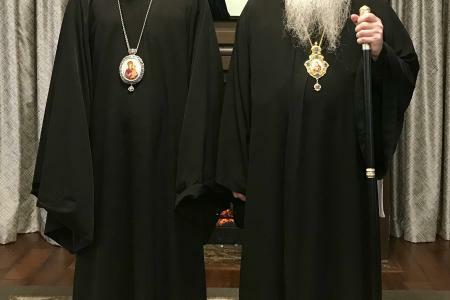 Among the theological institutions they visited were the Moscow Theological Academy at the Holy Trinity-Saint Sergius Lavra, Sergiev-Posad; the Sretensky Theological Seminary; and the Saint Tikhon Orthodox University of Humanities. 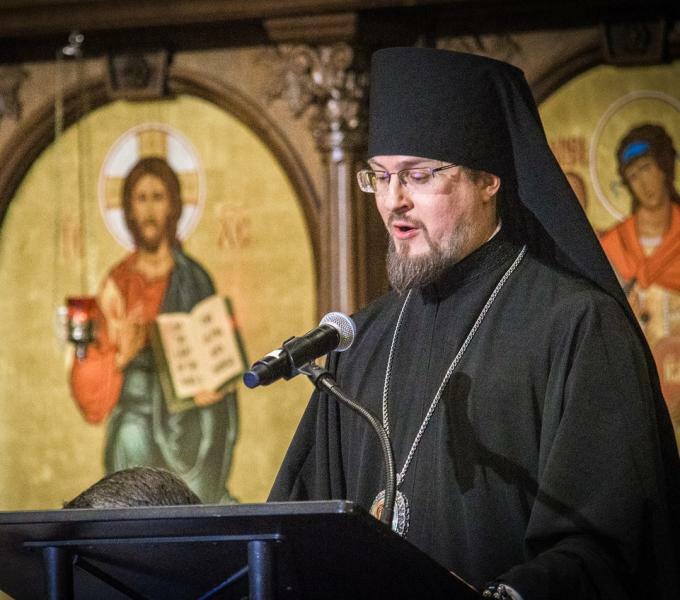 Also taking part in the meeting on behalf of the Orthodox Church in America were His Grace, Bishop Daniel of Santa Rosa, and Archdeacon Joseph Matusiak, personal secretary to the Metropolitan Tikhon.